I think there is something distinctly special about a layer cake. Layer cakes can’t be whipped together in an hour, or mixed in one bowl, or toted easily to the park for an impromptu picnic. They take time and a little planning, and they are usually made for a special event- weddings, birthdays, anniversaries. Layer cakes are not cut into pieces and laid on a plate. 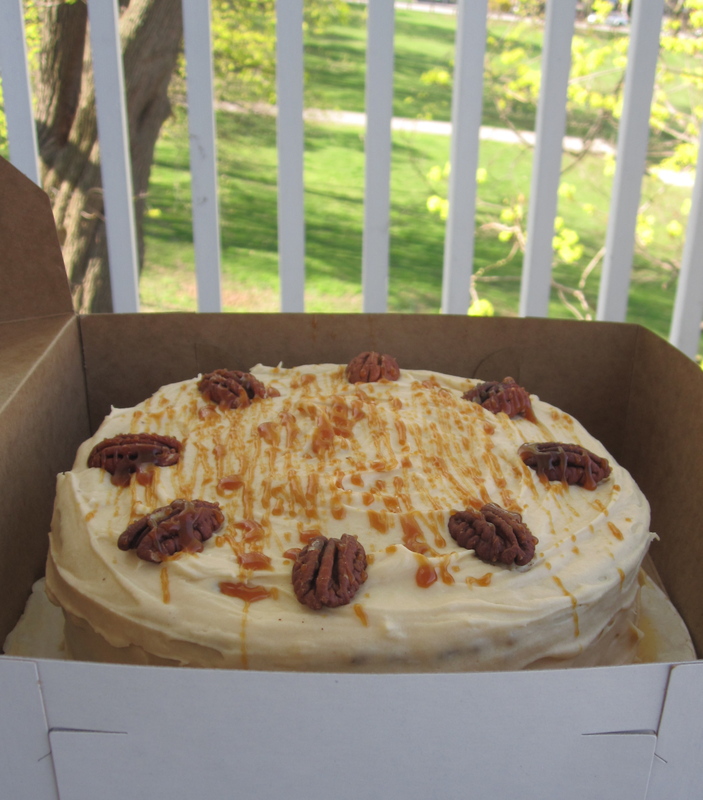 They arrive, with precarious height, do-not-touch peaks of icing, and in this case, rivulets of salted caramel. Two layers of moist chocolate cake made with coffee and buttermilk are encased in a salted caramel frosting and filled with chopped toasted pecans and caramel. And of course, drizzled with more caramel and decorated with toasted pecan halves. I have to give due credit to my coworker and friend Beatrice for inspiring this one: she suggested I make a turtle cake. It’s got the slight crunch and caramel-y decadence of the candy with the lavish proportions of a cake meant for celebration. Preheat the oven to 350 degrees. Butter (or use cooking spray) to grease two 8-inch round pans*. Line with parchment paper (to do this, fold sheet of parchment in half, and then in half again. Using the bottom of the pan as a guide, trace and cut the square into a quarter-circle- when you unfold, you should have a circle the size of the pan). Grease the parchment and sides of pan again. Beat together the flour, sugar, cocoa powder, baking soda, baking powder, and salt with an electric mixer at low speed. Whisk together the buttermilk, oil, eggs, and vanilla in a medium bowl. Slowly beat the wet mixture into the dry ingredients until just incorporated, and then slowly beat in the hot coffee until fully incorporated. Pour the batter into the prepared pans and bake for 35 minutes, or until a toothpick inserted into the center comes out clean. Let the cakes cool in the pans for 30 minutes, and then- very carefully- invert the cakes onto a rack to cool and peel off the parchment (if you want to be extra careful, run a knife around the edge of the pans before inverting). Keep oven on if you plan on toasting the pecans. * you may choose to use one or both of the layers; I used one. Turn oven down to 250 degrees. Spread pecans evenly over a baking sheet lined with foil. When oven is heated, toast pecans for 5-8 minutes, turning once or twice during baking. Be careful- these will burn easily. When pecans are finished, remove from the oven, allow to cool, and set aside 8 pecan halves. Chop the remainder into fine pieces. In the meanwhile, cream together butter and cream cheese with an electric mixer. Gradually add the powdered sugar. Add milk as needed, as I found the frosting to be very stiff. Beat for a few minutes- the more air, the better! Set aside one cake layer to freeze or use later (or alternatively you could use both cake layers to make an extra tall cake- I prefer mine on the more petite side- in any case, you will have enough frosting for both layers). Place the other layer on a cake round or plate, so that the flat bottom of the cake is facing up. Using a serrated knife, slice the layer in half (insert the knife in about 1 inch; using your hand to turn the cake, saw around the edge of the cake several times, inserting knife in further an inch at a time). Remove the top layer carefully and set aside. Using a small offset spatula, or small rubber spatula, dollop a generous amount of frosting on the top and spread the frosting outward in small circular motions. Continue adding more frosting until layer is covered. Using a spoon, drizzle 2 tablespoons of salted caramel (or more if you wish!) evenly over the frosting. Sprinkle chopped pecans evenly over the top. Place second layer over the top. Place 8 toasted pecans halves evenly around the perimeter of the cake. Using a fork and a little bit of caramel at a time, very carefully and slowly drizzle caramel across the top of the cake.